BPMN Tutorial: How to Use BPMN Data Object? Current: BPMN Tutorial: How to Use BPMN Data Object? An execution of business process often involves the use, creation and manipulation of data items. For example, invoice in an ordering process. 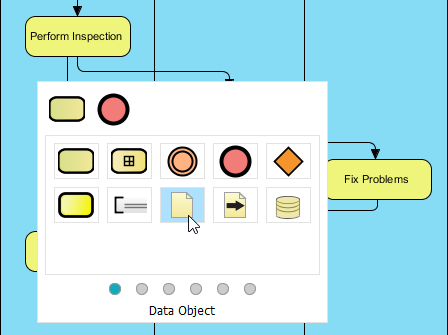 In BPMN, these items can be visually depicted by a document-like symbol called data object. The state of a data object may keep changing throughout a process or processes. Just take invoice as an example. Typically, an invoice will undergo states like open, canceled, unpaid, pending, paid, overpaid and underpaid. In this tutorial we will show you how to create data object in a BPD, and how to define its states. You will also learn how to reuse a data object in a process, with different states selected for different instances. Download Tutorial.vpp. You can also find this file at the bottom of this tutorial. 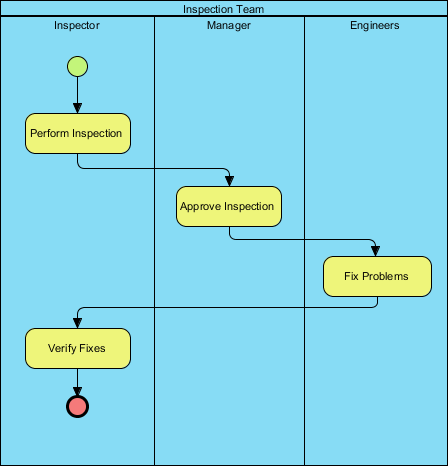 Let's create a data object from the task Perform Inspection. Move your mouse pointer over the task. Press on the Resource Catalog icon and drag it out. 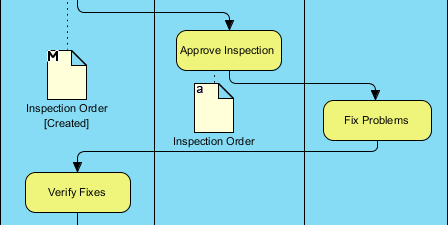 Enter Inspection Order as the name of data object and press Enter to confirm. Let's set the state of the Inspection Order Right click on it and select State > Create... from the popup menu. In the Create State dialog box, enter Created as (state) name and then click OK.
Let's continue with the remaining flow of the diagram. Let's say after the task Approve Inspection, the Inspection Order will be in 'approved' state. Let's represent this. 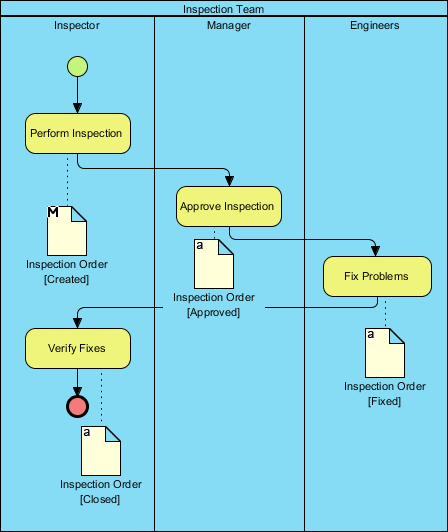 First, create a data object from the task Approve Inspection and name it Inspection Order, which is the as the previously created data object. Press Enter and you will be prompted to confirm the reuse of data object. Click Yes. You can see the data object is created with letter 'a' appear at top left, while the original data object (shape) has an 'M' appear at same position. The letter 'a' stands for auxiliary view, while 'M' stands for master view. Each model element can have one master view and unlimited number of auxiliary views. The placement of element in model hierarchy is controlled by the master view. Let's create a state for Inspection Order. Right click on it and select State > Create... from the popup menu. By the way, in the popup menu you can see the state Created available for selection. In case you need to represent a state that has been created before you can simply select the state there. In the Create State dialog box, enter Approved as (state) name and then click OK.